Wildlife by Fiona Wood. Poppy, an imprint of Little, Brown. 2014. Reviewed from ARC. The Plot: It's time for the "dreaded term" that is an "outdoor education camp." Nine weeks away from home, in the middle of nowhere, just you and some classmates and teachers. Sib -- Sybilla Queen, 16 -- will be going. It's both dreaded and looked forward to, and she'll be going with friends and teens she's known her whole life. And all that time away from home! Things aren't quite what she expects, though, when she starts a romance with popular Ben Capaldi and her best friend Holly veers between jealous and supporting. Lou, also 16, is new to the school and the group. She stands out, not just for being new, but for also not caring if she makes friends or enemies. Instead she sits back and observes. But if she's not willing to let people into her life, can she really tell others about how they're living theirs? The Good: Wildlife - first, for the record, every year there is one book whose name I just repeatedly get wrong. This year, whenever I say Wildfire, know I mean Wildlife. Wildlilfe alternates between two stories: Sib and Lou. Sib's story is about the girl who before school starts gets her braces off and has her acne clear up -- you get the idea. The cosmetic changes are even more amped up, because she posed for her aunt's advertising campaign. A glammed up version of Sib is what introduces her classmates to the "new" Sib -- except it's still the same old Sib, inside. The New Sib now has a new boyfriend, Ben, and she is both flattered and scared by that. Yes, she likes him, but it's her first real boyfriend and she's just not sure what she wants or how she wants to be. Her best friend, Holly, is there, always being supportive and telling Sib the way she should be treating Ben. Here is Sib describing Holly: "Maybe I need to explain that Holly's mean is not really meant to be mean -- it's just Holly! And you get used to it!." The reader doesn't need Lou seeing the Sib/Holly friendship to realize the relationship is toxic, and unhealthy, and Sib has no idea that Holly is that mean. Lou's boyfriend died. It's probably best to get it out there, up front. She is still grieving and isolated, keeping the world at arm's length. Her moms think that the "outdoor education campus", nine weeks in the "wilderness," will somehow help. (While Lou hasn't attended the school before, one of her mothers went as a teen.) Lou's story is one of grief and loss and recovery, and putting together ones life. She's slowly drawn into the world she finds herself in, not through the other girls in her cabin -- Holly has marked her as an enemy, an outsider -- but through Michael, Sib's other best friend. This is not a book where Lou and Michael fall in love, or where Lou finds new love. No, it respects Lou's loss and the time, the long amount of time, it takes when a loved one dies. What Michael and Lou offer each other is more important: friendship and acceptance. Lou needs that, even if she won't admit it, and Michael needs it, because he has to go through the pain of seeing the person he loves -- Sib -- happy with someone else. This isn't a book about Sib and Ben falling in love. Sib and Ben's relationship is important, and I loved how Sib sorted out all her own complicated feelings about Ben. She's attracted to him, she wants a relationship, but she's also not quite sure about him or herself. Ben's a decent enough guy, but he's a teenaged boy. He doesn't pursue Sib until after she's glammed up. He and Sib are put together in a heightened time and place, the intensity and isolation of the wilderness experience. Out in the real world, would they have anything in common? And does that matter? One thing I love about Sib is that, when it comes to Ben, part of Sib realizes all this. But part of her is also young and new to relationships so she is unsure just what she wants from Ben and how to proceed, both emotionally and physically. So Wildlife is about their relationship, yes, but Wildlife is about a more important relationship. Wildlife is a book about the friendship between Holly and Sib. Sib is in some ways a passive girl. It's not the type of passive of someone who doesn't know what they want; it's the passive of someone who is content with what they have. So content that it's not that she lacks strong feelings about things, but that she doesn't care so lets Holly take the lead. It's like the old deciding where to go for dinner: it's not that the person who says "I don't care" doesn't care, it's that they have no real strong urge for Italian or pizza or hamburgers or Indian, they just want food, and if you care, fine. It's the type of passive that allows Holly to be the leader, and for Sib to go along with it. It's what some people call "too nice." But here's the thing about that type of "nice." It is genuine. Sib truly loves, and forgives, Holly. Holly is a wounded girl: from the start, Sib explains that part of her tolerance for what Holly does is that she, Sib, knows the "real" Holly. What the reader (and Lou) sees is a girl who has gone from acting mean to being mean. A girl whose own insecurities and need for popularity and acceptance means that she's not afraid to push others around, and push others buttons, to get what she wants. Holly is the type of girl you don't want your child to be friends with: not because she's dangerous, but because you know at some point, she's finally going to go too far and hurt your child emotionally. And much as I grew to hate Holly, I have to confess: given her own emotional wounds, I wonder if Holly at some point will "grow up" and stop hurting others to make herself feel better. I wonder if she will ever become self aware. Still, that is just wondering --in the meanwhile, I want those who Holly hurts to stay away from her because they can't fix Holly. Only Holly can. Wildlife is about Sib and Holly's friendship slowly, messily ending. Just as the boarding situation helps Sib and Ben's relationship progress, it also helps Sib and Holly's friendship implode. Oh, the reason I put "wilderness" in quotes earlier is that this isn't tents and camping. There are cabins, and meals, and toilets, and showers, and classrooms. It is in the middle of a wilderness area, with opportunities for tents and camping and no toilets or showers. Like many experiences, it's a very controlled "wilderness." It's also a great time for all the teens to practice being grown up and older with a safety net. They are away from home, yes; but there are still rules and teachers and chaperones around. This is one of my Favorite Reads of 2014, because of the character growth and the dynamics between people. 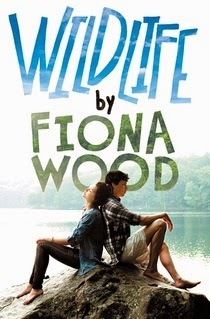 It was my favourite title in Australian YA last year - beautifully expressed review, Liz. Reading - It's Good For You!